An historical coming-of-age story of Annabell, a precocious twelve year old who may remind you a bit of Scout. With her quiet sense of decency, Annabell is at the center of this compelling book that examines bullies and bigotry. A “hauntingly” original story good for middle grade boys and girls-I would definitely consider this a keeper! This is Lauren Wolk’s first book for young adults and hopefully the first of many. A young girl's kindness, compassion, and honesty overcome bullying. 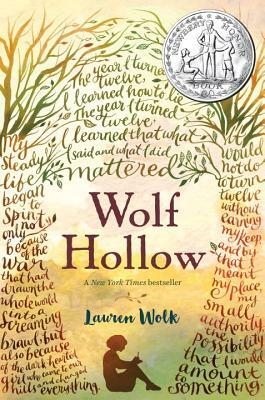 Brilliantly crafted, Wolf Hollow is a haunting tale of America at a crossroads and a time when one girl’s resilience, strength, and compassion help to illuminate the darkest corners of our history. Lauren Wolk is an award-winning poet and author. She is the bestselling author of two novels for young readers, Newbery Honor–winning Wolf Hollow (2016) and Beyond the Bright Sea (2017). She was born in Baltimore and has since lived in California, Rhode Island, Minnesota, Canada, and Ohio. She now lives with her family on Cape Cod.